VBS was exhausting. Really, really exhausting. But I really loved doing it. The girls were sweet, if rotten, and I’ll definitely miss them. Although you can request kids to be in your crew, so maybe I’ll do that. I want Renae again, she’s so adorable and mischievous. You’d think — and hope — that the kids would be too tired by the last day to be too rotten. Nope. They were comfortable with me and Joelle, so they decided to be especially rotten. Renae stole my backpack during snack and I had to chase her around the room to get it back. Then I tripped over my shoelaces (I kid thee not) and fell on my face. She gave it back after that. Annelie and Sherry wanted to play Duck, Duck, Goose while the others were in the bathroom. They chased each other into the next room several times, and I had to go after them. After Joelle gave Renae a piggy back ride, everyone decided they wanted piggy back rides. We gave Claire, Renae, and Marialena rides for a couple of minutes until we could go into Imagination Station. Once there, Renae didn’t want to sit down. She played with Joelle’s hair the whole time. I gave her three hairbands to use, and Renae gave me this awed look and said, “You have a lot of hairbands!” I had one tied around my shirt and two in my bun. We went to Games after that, and we were early. Renae wanted to play Tag . . . while on our backs. Claire and Marialena wanted to do that, too. I got Renae, Joelle got Claire, and Austin (another crew leader) got Marialena. We ran around with the girls on our backs and they tried to tag each other. Hula hoops on the ground served as bases, which we ran into when we needed a break. It was incredibly tiring, but fun. One of the games was a relay. Our crew finished early. The girls must have been bored, because Renae started piling grass on top of my head, and everyone joined in. They got a good half-inch of grass on there. Then they covered my lap, stuffed grass down my name tag, and sprinkled it down my shirt. When I stood up, grass was raining off of me. I kept finding bits of grass in my hair and clothes for the rest of the day. Back in the big room where we started the day in, Renae said she wanted to sit in my lap. I let her, and then she leaned back and pushed me over. She just laid on top of me. Her hair was in my face. She finally got off of me when the music started, but when the song ended, she wanted back in my lap. Not wanting to be suffocated again, I laid on my front, and she sat on my back. The arrangement was good until the music began again. Because she decided to dance on my back. Stomping. It hurt a bit. Not too much. At the end of the day, I passed out goodie bags. 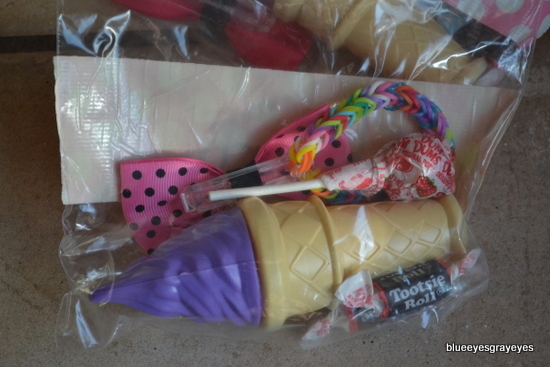 Each had three lollipops, two Tootsie Rolls, a hair bow, a rubber band bracelet, and an ice cream cone-shaped container of bubbles. Claire gave everyone bags of candy, which was awesome. 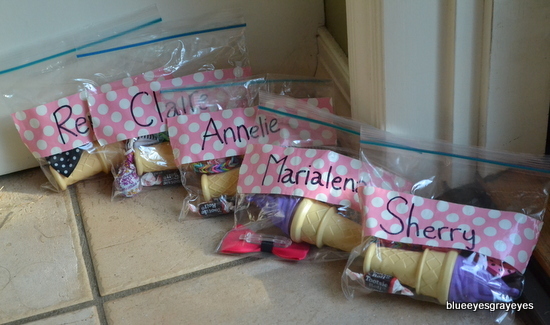 Then Renae’s mom gave Joelle and I these fancy little lotion bottles and a thank you note. Annelie’s mom gave us dark chocolate and something called Pocky, which tastes a bit like chocolate-covered sticks of air. I’m definitely going to be a crew leader again next year — hopefully I can have Renae in my group. Because as naughty as she is, I really do like her. 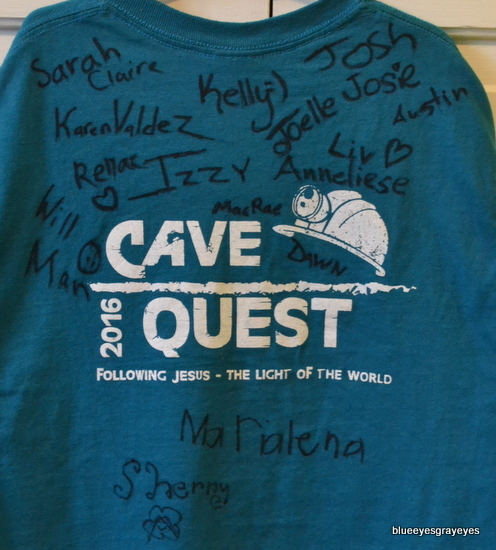 I got a ton of signatures on my VBS T-shirt. Seventeen, I think. By the way, I won’t be posting much this summer — on here, or on Happy House of AG. I’m going to be gone for two weeks with very limited access to WiFi. I might be able to schedule some posts, but idk. LOL! XD You’re so funny, Loren. :) I’m glad you had fun at VBS. Nice! :D Renae sounds so fun! :P :) When will you write your wordcrafters chapter? Awesome post! Glad you had a fun week. This was hilarious! Renae sounds awesome! Thanks! Yeah, Renae is pretty cool. Yes the mischevious ones are always the ones that in the end you love! The goodie bags are so so cute! :) I’ll miss all your awesome posts for 2 whole weeks! ;-) Hope your vacation is fun! You must be a saint! Joking, VBS sounds fun but tiring. It reminds me of the last weeks if school last year, almost nobody came, and I just played with the first graders. It was actually pretty fun.